I am getting old. We all are. That’s a part of the natural course of a life. We accumulate knowledge and experiences, and the world leaves its mark in our faces and bodies. For me, the grey hairs started arriving a few years back. I taught myself to dye my own hair. Now I find my eyes getting old, which means the days I will soon need to wear glasses long term are fast approaching. Today, I still have more good days than blurry ones. Other than that, I appear to be in good health. Physically. Mentally is a rather more complicated story. I find myself being very reflective, going over old battles, injuries, joys, and sorrows. My age related ailments, the separation, and daughter becoming a woman, make for a rather intriguing incubator for the “Who am I?” questions. I have always preferred to keep an open mind, and while I have not always been successful in that regards, I do feel I am a little more open than many others I know. With that in mind, I find myself pondering life choices, society in general, and the possibilities for the future, and I always prefer to find a contrasting basis to start from. Black and white. On or off. Natural vs contrived. And I have never liked aggression, and by aggression, I mean aggressive competitiveness. I never saw the point… Well, that’s not true. I did, and do, see the point: to get what you want quicker, be it an end to a discussion, or something more material. I just never saw it as a productive way of getting things done. It is single minded, selfish, and often leaves a path of hurt and destruction. Is it really worth getting what you want by slicing your way through others? I would watch others bludgeon their way through others, and what they didn’t see was what they left behind. Interesting phrase that. What the “end” actually is can be very subjective. To the one who gets the “prize”, the end is the prize. To those that were pushed aside, the end is the resentment, hurt, fear, or aggression. To me, the end is the combined total of both sides: Was the prize worth the carnage? In the end, if you had to hurt others to get what you want, was that the best option? The end may justify the means, if the means are worthy of the end. Thing is, we as a race have imposed so many rules and standards on ourselves over the years, and for a very long while, different cultures imposed their own rules without interfering with another, apart from a few crusades, wars, etc. Now we head into a global community, and the clashing of different rules is a cause for so much friction, and suffering, because it is constant and available to everyone. These rules are contrivances. Conceptual guidelines that only humans, with their capacity for high level cognitive processing, can fully appreciate, or even create. Sure there are “rules” found in nature, naturally occurring rules. No-one created these rules as such, at lease, no-one human. So I have been contemplating the difference between natural rules, and the many, ever growing rules, humanity has placed upon itself over the past few thousand years. So many of them contradict what we see nature. This is where I may get to a point where I offend some people. As I said, I like to keep an open mind, and I enjoy testing the boundaries of my world. Please allow and forgive my pontifications. Lying is unnatural. It is not something we see a lot of in the animal kingdom – Self-Deception, or even the Deception of each other. Some trained primates have shown a capacity to be deceptive, but in nature show no, or little capacity for it. Humans are the only known creature capable of self-deception, or being deceived. That’s right. We are more gullible than our fellow creatures, and we demonstrate this daily in our lives. We are regularly deceived by advertising, the media, politicians, even our friends and family. We all know someone who is good at talking other people into believing something. random items. Although, these examples are not true demonstrations of materialism, where the goal for an impression of wealth or ownership. Marriage is unnatural. That one may ruffle a few feathers. I’m not saying that marriage is wrong. I am saying that marriage is a human concept that does not have a equal in the natural world. Yes, there is examples of coupling in the natural world, but this is quite different to marriage in that the coupling serves a specific survival purpose. Once that purpose is done, the coupling is no longer maintained. In fact, in some animal groupings multiple coupling will occur, which goes completely against the traditional Christian concept of marriage. What I am trying to draw here is a line between what is human, and what is natural, and marriage is something human. Money is unnatural. I think this one is pretty self evident. Money is a human contrivance. Something that started of as a means to simplify a bartering system, has grown into something that infects all aspects of life. Almost anything that you may want to do, have, or need, will require money. We do see some people who go “off-the-grid” and try and a make a life for themselves away from money, and some make it work. Money is like an infection that has so worked its way into the body that its very removal would cause more harm than good. I could go on, but I would only cloud the purpose. I do not wish to say that rules are wrong and should be dispensed with. Nature has rules, just not as many as we have, and some rules are good. They give a sense of boundary, and range. They can be comforting. They can also be confusing, overwhelming, and contrary. When rules are used as a weapon, rather than a tool; to control people rather than guide and support them, then these are the times when rules go too far. They become restrictive, painful, and cause much anguish, fear, and hate. Have we over legislated our lives? Have we imposed too many expectations, and restrictions? Have we made it all too easy to be “wrong?” Have we actually created an aggressive and fearful society? If so, what can we do about it? And when a caged animal is cornered, he either dies, or becomes aggressive. A natural reaction. What we are seeing here is not a caged animal, but packs. Potentially aggressive packs, all being cornered, by ourselves. 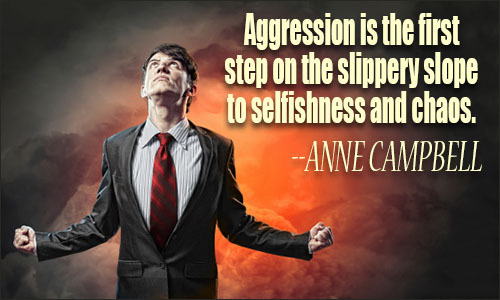 Aggression for survival is natural. The way we do it, not so natural.